The Mayor began our interview talking about a college student’s commute from Downtown Los Angeles to California State University Northridge. The student leaves home early in the morning on a bike. He soon hops on the Metro Red Line to North Hollywood. In North Hollywood, he transfers to the Orange Line. When he gets off the bus, he finishes his trip on bicycle. In the evening, he does the same commute in reverse. The father in the story is, of course, Antonio Villaraigosa. Mayor Villaraigosa’s anecdote wasn’t just a great way to start what turned out to be a long and animated interview, which took place on Thursday, July 12th. The story also highlights one of the most vexing problems he’s faced as mayor of the city of Los Angeles: How does a mayor help lead a city away from its reliance on the automobile when the culture of the single-passenger car is so ingrained in Los Angeles? But getting Los Angeles from where it was at the turn of the century to where it is today — and to where the mayor wants to see it in the future — was and is quite a lift. Especially when faced with a skeptical public and a court that places form over function. “On bike lanes, they’re telling me I have to do a CEQA (California Environmental Quality Act environmental review) process on bike lanes?” he asked rhetorically. “That’s why you can’t build anything here. Whenever you try to build something it’s World War XVI.”Environmental reviews — and the lawsuits they can spawn — have been a constant thorn in the side of the mayor who blames a political left wing for enabling a system where the environmental process slows or even stops small projects that could make a positive environmental difference. For a recap of the Pico-Olympic plan, minus the plan being shelved indefinitely after the last public meeting, click on the picture. The mayor firmly rejected the premise, arguing that the city transportation initiatives that defined his first term as mayor were necessary, both as transportation projects and public relations pieces needed to rally the public for larger initiatives. In 2001, during his first, ultimately unsuccessful, run for mayor, Villaraigosa pushed the idea of creating a city-wide rail transit system, but the public wasn’t ready. Given a second chance in 2005, Villaraigosa focused the campaign on both the big and the small. The Subway to the Sea, the colorful name for the Westside Subway, was mixed with other, more modest, proposals. To hear him tell it, Tiger Teams to clear parked cars in travel lanes, a ban on road construction during rush hour and an aggressive traffic signal retiming plan weren’t just about physically moving traffic, they were all about moving people mentally, too. But of course, not everything went according to plan. The aforementioned Pico-Olympic Plan ran into neighborhood resistance over the removal of peak hour parking. Bill Rosendahl and Paul Koretz, the two local City Council Members representing the west portion of the plan, were in opposition of the project, and in 2008 a judge ruled that the plan needed a full environmental review. Just because CEQA is slowing the city’s Bike Plan and other projects doesn’t mean that there was a lack of progress in the last year. The city officially installed 76 miles of new bike infrastructure last year. Even critics, some who dispute a small amount of that total, praise recent bikeway mileage as a huge increase from previous years. 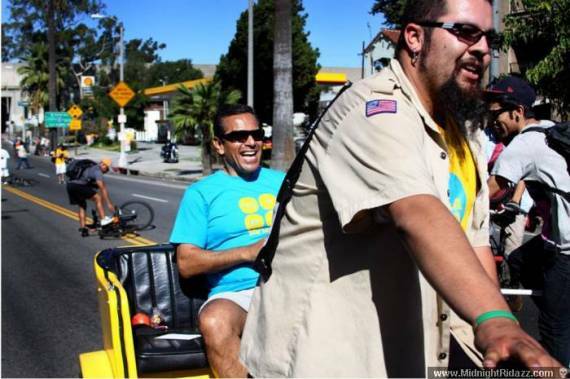 Some point to the mayor’s July 2010 crash — where a parked taxi pulled into the street and forced Villaraigosa from his bike and sent him crashing to the ground — as the moment when the administration began to take bike safety and bike infrastructure more seriously. The mayor said the groundwork was laid earlier. It wasn’t until after the mayor’s elbow was shattered in the aforementioned crash that city staff understood how important an issue bicycle safety was. 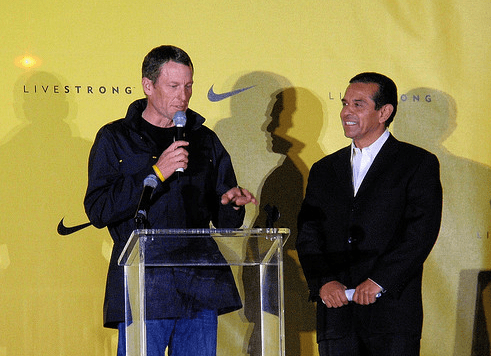 Calling it a “teachable moment,” Villaraigosa used the crash as a “call to arms.” Using the energy of the existing bicycle advocacy community, the mayor called a Bike Summit in the summer of 2010, which doubled as an exercise to show the Eeyores of city staff that it was past time to get moving. Quickly following the August 2010 Bike Summit was the first CicLAvia, followed by the battle and passage of the “surprisingly progressive” bike plan. Less than a year after the crash, the city was working on a record number of bike projects, had created a dedicated fund for bicycle projects from Measure R, had appointed Jaime De La Vega to replace lifetime city staffer Rita Robinson as head of the city’s Department of Transportation, and was bringing in a team of bicycle design experts from the Netherlands for a “design charrette” to empower the vision of city planners. The year after that saw roughly 76 miles of new bike infrastructure. The Spring Street Green Buffered Bike Lane and the Main Street Buffered Bike Lane have formed the backbone of an emerging downtown Los Angeles bike network, and the Boyle Heights’ First Street Green Bike Lane and the Main Street road diet in Venice were both welcome additions. Nobody is ready to declare Los Angeles a bicycling paradise, and many cyclists remain frustrated when comparing L.A. to Long Beach, but progress is being made. Not to say everyone is excited. The mayor noted that many media outlets praised the bike plan’s passage, but still jumped on the projects in the plan during their implementation. The most notable example of this is the Spring Street Green Buffered Bike Lane, arguably the most progressive bike infrastructure in the city, which was panned repeatedly by the Los Angeles Times, both in their news and editorial sections. Another area where the media has not been kind to the mayor is congestion pricing. In 2008, Metro received a grant from the U.S. Department of Transportation to try an experimental pilot program by converting to High Occupancy Vehicle lanes to High Occupancy Toll lanes. Congestion pricing in various forms has been tried across the world and has uniformly shown reduction in congestion in all lanes, HOT and regular mixed-use. At no point during the interview did Villaraigosa show more enthusiasm than when discussing congestion pricing and the political battles needed to get the approval of the Metro Board of Directors. Things became so ugly that Metro had to change which freeways would receive the HOT Lanes. 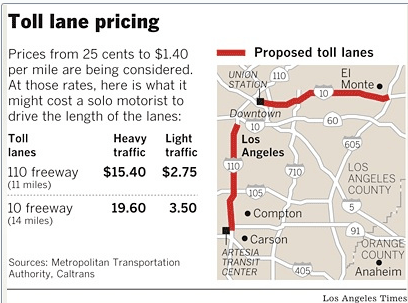 At first, the plan called for the I-10 and I-210 to receive the HOT Lane treatment. After San Gabriel Valley politicians, led by County Supervisor/Metro Board Member Gloria Molina, State Senator Gloria Romero and a bipartisan team of congress members, completely flipped out, plans for the I-210 were scrapped and the I-110 south of Downtown Los Angeles was added to the plan. Overall, the federal government paid $213 million for the congestion pricing pilot program, most of which are going to expanded bus service and stations. Metro is currently studying five other corridors for congestion pricing. Tomorrow, Streetsblog will post “The Subway Mayor Triumphant,” part two of the mayor’s interview, with topics including transit, transit expansion, Measure R and Measure R+. Does he honestly think it’s “the left” who’s using CEQA to sue over parking changes? I took it to mean that “the left” created a system that allows anyone, right or left, to sue over parking changes and the like. This opinion I’ve heard frequently in the Beverly Hills vs. Metro subway battle, that CEQA makes it difficult to do any construction, even projects that are widely considered to benefit the environment. San Francisco’s bike program was held up for years essentially by a single person, Rob Anderson. My impression is that the Mayor was criticizing CEQA itself for “enabling” these lawsuits, and that legislation was undeniably a product of “the left”. As far as who is actually doing the suing, it’s certainly not exclusively the right; NIMBY-ism tends to be pretty bi-partisan. In the specific case of the Pico-Olympic project, it was mostly objections from Westsiders, which makes it likely that there were a number of voices from “the left” involved. This blog (which tends towards the left) was pretty clearly against that project (though not necessarily because of the parking removal), and essentially cheered the various court rulings against it (even though those rulings may have ended up making bus and bike lane installations more difficult in the long run). I’m inferring this, but it’s also usually left-of-center politicians and interest groups that defend CEQA and resist changes to it. His main point was that environmental protection laws are being used to hold up projects that are clearly beneficial to the public good. Sigh. There was a time WAY before the Orange Line and the subway to North Hollywood back in in the mid-1990s of my mass-transiting when I biked every morning from Encino north across the valley to the Northridge Metrolink station. I’d take that train downtown to Union Station and then I’d either Red Line it or bike to Western and 6th Street. And yep, I’d reverse course for the trip back to Encino every afternoon. I wish the mayor would tell that story, because it puts his son’s story to shame. Seriously though, FANTASTIC interview. Looking forward to part two! CEQA is used as an all-purpose brickbat, but many preservationist types are environmentalists and liberals. There’s a difference between local-type conservationism and environmentalism (not supporting density due to increased congestion and crowding) vs. global-type environmentalism (increased density means less farmland gets chewed up, less greenhouse gas emissions from reduced living space). Both are left positions but the former use CEQA to beat the head over the latter. Don’t get me wrong–I agree that CEQA has had a lot of unintended consequences (not necessarily good ones) for transportation projects. But is that really a partisan issue? Also, NIMBYism may run strong for people of all political colors, but I’ve personally seen it used more often by right-leaning folks to obstruct projects. Of course, my expereince is with a pretty conservative jurisdiction, so that’s hardly a scientific sampling. Only in America will you find a parking allowed on major city arterials. It’s heartening to see that America’s most car-crazy city is moving forward with some livable streets improvements. Too bad it took the mayor getting in a bike crash, but sometimes a minor trauma causes a major epiphany. Loss of parking is no longer considered an environmental impact under new CEQA guidelines. Loss of parking does not trigger an EIR.